Do you need a P-3 visa? Maybe you are an artist or entertainer who is part of a culturally unique program? Moreover, your program is located in Montana, North Dakota or Wyoming. If so, then we can help you! This article on the P-3 visa is part of our guide to US visa types. If you would like more information, then please keep reading. But, if you know you need help now, please contact us now. Indeed, you could even book a consultation. What is a P-3 visa And Why Do You Need One? The P-3 visa fits under the USCIS’s heading of visas for athletes or performers in the P visa category. It is unusual in the sense that individuals or groups use it to come to the United States to participate in cultural events or events that help people understand the performer’s art. In theory, the USCIS does not require that you receive pay for your performance. But, if you are an unpaid performer, and an amateur, then the B visa is a better and simpler choice. An example from our experience illustrates the P-3 visa type. If you are running a festival dedicated to teaching children violin, and you want to bring a violin teacher that specializes in Gaelic music this visa is your ideal choice. As part of the application, you will convince the USCIS that your Festival is a cultural event. Also, you will show that your performer is teaching a unique or traditionally ethnic type of music. You petition the USCIS for a nonimmigrant worker. First, you’ll need a contract between yourself and the person coming to perform in the United States. Also, you have to provide USCIS with an explanation of the event and an itinerary. Very important to the application is proving through affidavits or testimonials from experts the authenticity of your performer in presenting or teaching the unique and traditional art. As an alternative you can provide proof that your performer is culturally unique through published materials. Overall, perhaps the most challenging USCIS requirement to meet is providing a written consultation from an appropriate labor organization. This requirement is derived from the O-1 visa for exceptional artists. Everyone who is an artist who wants to perform in the United States must have the appropriate union sign off on the process. The idea here is that, for example, the musicians union can stop unqualified and lowly paid musicians from taking jobs that should go to United States’ musicians. The USCIS authorizes up to one year in P-3 status. If the performer is coming to join a tour that last longer than a year, you can extend the visa for an additional one year. If the performer is part of a family, the family may join the lead performer as dependents. 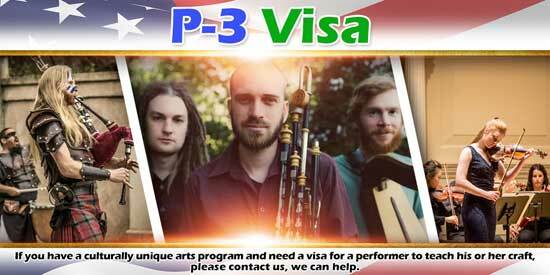 Also, if the performer has essential support personnel, they are eligible for P-3 visas as well. One very important aspect of the P-3 visa keep in mind is time. Petitioner must start working on this P-3 visa process early enough to get the performer into the United States for the event. Entertainment labor unions can be slow in providing the required consultation. The USCIS is not necessarily fast and processing any visa petition. Your worker must also plan apply for the visa in his or her home country. We have experience with the P-3 visa and understand what it takes to get one approved with the USCIS. If you are offering culturally distinct performances or culturally unique program, we can help you. Please contact us.